I tried out a few more variations of this week’s half chevron stitch. 3. The first row is the closed half chevron stitch. The second row is individual half chevron stitches worked vertically. 4. Small half chevron stitches are worked in the spaces between half chevron stitches. the next row , I tried working rows of half chevron stitches together. A closer version of vertically worked half chevron stitches is worked in the last row. 5.In this row ,the chevron part of the stitch is angled, individual stitches are worked in a line. 6. in this row too, the chevron part of the stitch is angled, but the half chevron is worked in the outer side of the angle, looks like cretan stitches worked over a line of zigzag back stitch, I just wanted to see the how the stitch will look if done this way. The next row is the combination of plain half chevron stitches with angled half chevron stitches. 7. Instead working one stitch, I tried working three stitches, similar to a buttonhole variation. 8. First row, is a trial of angled half chevron stitches at right angles in the beginning. later , I did not like the way it looked , so changed the pattern and worked all of them facing one direction. 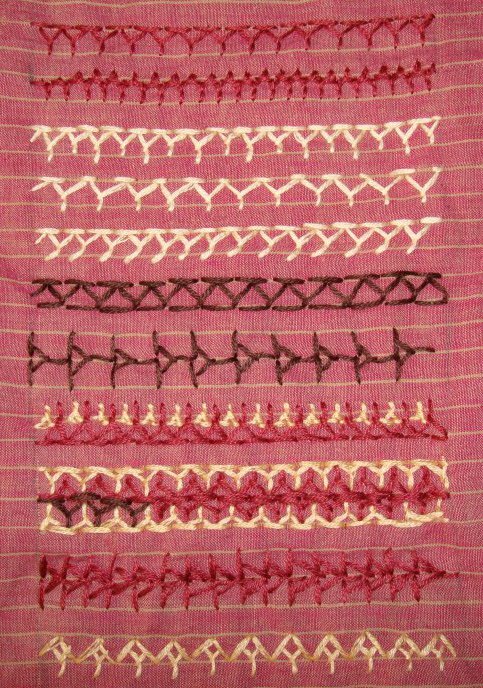 A row of buttonhole stitches are worked over arrow of half chevron stitches. 9. Detached chain stitches are worked in between half chevron stitches. 10. After working zigzag back stitches with half chevron stitch, beads are added. 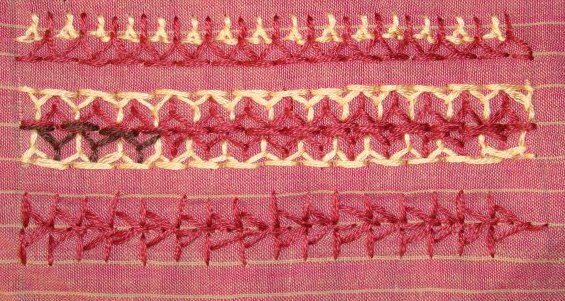 11. fly stitches are worked over a row of half chevron stitch, the broader version did not look good, so thinner fly stitches were worked. 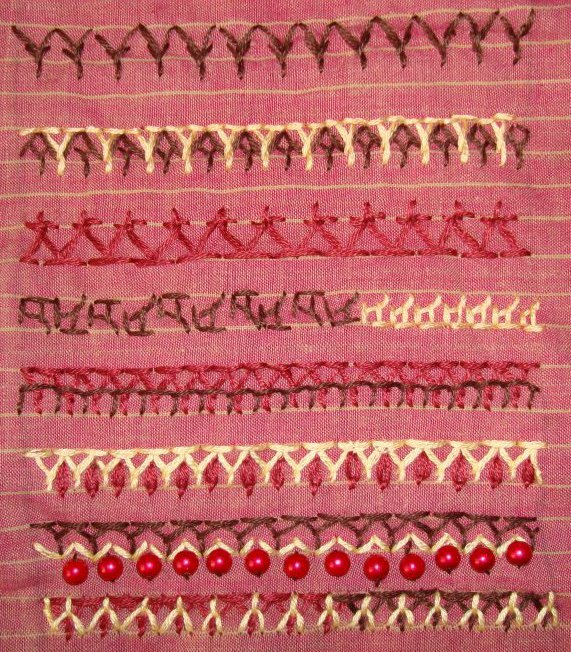 The participants of this challenge, are doing such a fine job of exploring this stitch, I enjoyed visiting their blogs and found that this stitch gives a lot of scope for experimentation. I also enjoyed working on this sampler. The 19th week stitch of this year’s TAST stitch challenge by SharonB is half chevron stitch. This stitch was also part of the earlier TAST challenge. I did not work on it then. This stitch is also explored in sampler form. This time I tired the variations on a striped cloth. 1. First row is the trial of this stitch. The second row, I tried the chevron part differently, the band is worked over the v-stitch. 2. in the first row, I tried alternating the height of the stitch. The second row the width of the band is varied. On the third row, I angled the stitch slightly. Will try and work a few more variations of this stitch.